Want to discuss your specific situation? 1. Source: Dharmapala, Dhammika, C. Fritz Foley, and Kristin J. Forbes (2009). “Watch what I do, not what I say: The unintended consequences of the Homeland Investment Act”. 3. Source: Bloomberg query (SRCH ). 4. Non-USD debt is often used to hedge the USD value of retained earnings in foreign subs (i.e. net investment hedging). Thus if cash is repatriated, hedges must be unwound. 5. Source: SVB FX Risk Advisory. 6. Moody’s Investor Service: $1.3trn, US Joint Committee of Taxation: $2.6trn, Goldman Sachs: $3.1trn, etc. 7. According to the 2016 Triennial Central Bank Survey of foreign exchange and OTC derivatives markets published by the Bank of International Settlements. 8. 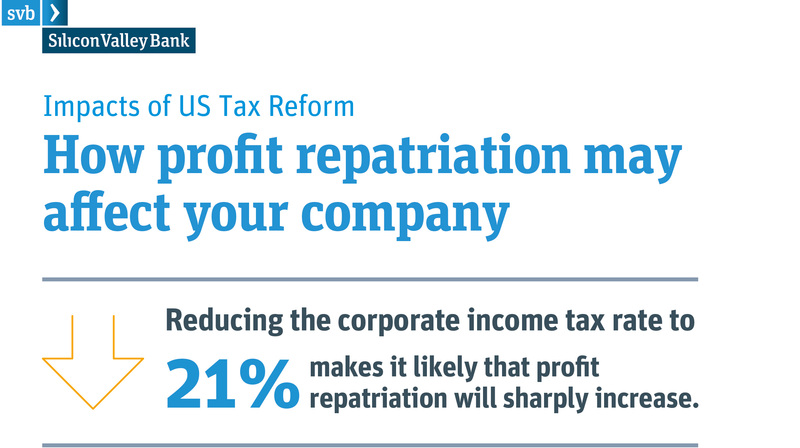 Domestic tax rate on repatriated funds was cut to 5.25%, down from 35%. 9. According to Bureau of Economic Analysis. $300bn estimate is based on a 5x trailing 5-year average repatriation. 10. According to the 2016 Triennial Central Bank Survey of foreign exchange and OTC derivatives markets published by the Bank of International Settlements. 11. One other important reason the USD appreciated in 2005: Fed hiked rates 8 times that year. 12. Moody's report - "US Non-Financial Companies: Cash pile grows 9.2% to $1.84 trillion; tech extends lead over other sectors”.